Over the years high quality digital cameras have become smaller, better, and most importantly cheaper. Unlike in the past when you had to shell out thousands of dollars to get a quality digital camera for personal and or professional use, you can now find an excellent model that will serve you well for long. If you have 100 dollars to spend on a new camera, for instance, purchase one of the 10 digital cameras listed herein to get a durable accessory with a high-powered lens system, a premium sensor, and an ergonomic base that fits comfortably in the hand. Picture quality is admirable and their suitability for use in most environments makes them ideal travel accessories for campers and outdoor enthusiasts in general. Do you venture on frequent outdoor trips that you treasure in photographs? To get a cheap yet powerful digital camera that delivers quality with each click of its shutter, PowerLead Gapo G051 is a popular model with several desirable attributes. Designed to resist water and dust, for instance, it is an excellent outdoor accessory. Its CMOS sensor (5mp) and digital zoom lens (8x) lens work in synergy to improve picture quality while its tight casing and suitability for underwater exploration have made its a preferred product by scuba divers and underwater enthusiasts with a tight budget. You also get a large LCD screen (2.7-inches) for easier setup and review of photos, scenes (night scenery, night portrait, sports, scenery, and underwater to name a few) for customizing photos, and a 12 months warranty. Gone are the days when photographers had to burn holes in their pockets to obtain quality digital cameras. With the development of high-performance budget models such as this Kodak PIXPRO, photography has become a cheaper and enjoyable process for professionals and individuals alike. With an original mode, you get a durable silver-themed accessory with a compact and portable design, a powerful 5x optical zoom lens (wide angled), and a large 2.7-inch LCD screen that you can use to set up photography jobs effortlessly. The powerful sensor offered (16mp CCD) enables you to zoom, enlarge, and crop photos without compromising clarity while the plethora of advanced features it comes with makes it one of the most enjoyable budget cameras to use. The3 auto exposure and face detection feature it comes with, for instance, not only detect facial features automatically but also improve subject highlighting to better quality. Its red eye removable technology, on the other hand, enables you to make instant touch ups while its panning shot mode enables you to shoot photographs in motion without streaking or pixelation. Unlike what many individuals think, the fact that you are spending money on a budget digital camera does not mean that you should sacrifice quality. Instead of spending your 100 dollars on a cheaply produced camera that will never fulfill your needs, purchase Kodak PIXPRO FZ43 instead. It is compact, portable, and has a striking red theme that does not fade over time. Picture quality is admirable courtesy of its wide-angle (27mm) optical zoom (4x) lens and CMOS sensor (16MP), while the 2.7-inch screen it comes with improves its convenience, particularly when preparing for a photography session or when reviewing your photos before sharing. In addition to the crisp photographs that it shoots, many individuals prefer it to its competition because of appealing 720p videos (HD) that it captures. An acclaimed point and shoot digital camera among individuals of all cadres, Canon Powershot A2200 is a powered 4x optical zoom camera with an aesthetic black theme, an ergonomic base, and a versatile 14.1MP sensor that improves the value of the photographs that it shoots. Even with its low price, this camera lasts long. The intelligent shooting situations (32) individuals get enable you to customize its performance on demand while its clear and large (2.7-inches) LCD screen eases setup. You also get an autofocus (AF) beam that comes in handy in quiet areas, a discrete mode for turning off flash and sound, and a dedicated video recording button (720p HD) for recording movies on demand. 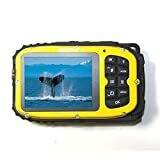 If you have 100 dollars to spend and do not mind carrying a purple digital camera during your numerous photography escapades, Bell+Howell Splash WP7 is a worthy product to consider. Featuring a compact and waterproof base that resists water damage at depths of up to 10 feet, it is perfect for use on dry land and underwater. Finishing is smooth and non-irritant while its high-resolution design (12MP) maximizes the quality of photographs taken in all environments. Bell+Howell Splash WP7 has a wide-angle digital zoom (8x) lens that shoots panoramic photographs and a 5MP CMOS sensor that improves depth and clarity. It is battery-powered (2AAA) and accommodates memory cards with up to 16GB storage. 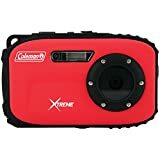 Coleman Xtreme C5WP is a waterproof (up to 33 feet) 12.0MP digital camera with a large 2.7-inch LCD screen and an advanced anti-shake technology that eliminates blemishes during photography. Even though cheap, its ability to shoot posture-sized photos without losing detail or compromising quality has won the hearts of individuals and professionals alike. The 10 scene modes offered enable you to experiment with your creativity while is smile shutter and self-timer systems enable users to shoot appealing self-portraits without the help of third parties. Coleman Xtreme C5WP has 32GB Micro SD card storage. The Coolpix line from Nikon has for years ranked among the most trusted and preferred digital cameras because of their ease of use and quality of pictures that they produce. In addition to the foregoing, this S2800 edition is also affordable and has a feature-rich design that most individuals appreciate. With an original, for instance, you get a 20.1MP silver-themed digital camera that supports HD (720p) video recording. The wide-angle lens (26-130mm with 5X optical zoom) that it uses captures clear portraits and panoramic photographs while its 230k dot LCD screen (2.7-inches) enhances its value further. 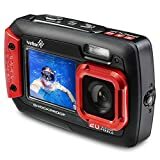 Specially designed for underwater photography, this Ivation digital camera is a premium red-themed accessory with a color LCD screens (dual), a submersible design (up to 10 feet), and a powerful 20MP system that shoots stunning photographs and videos. If you travel a lot and want a portable low profile camera that you can travel with effortlessly, this model is one of the best around. It is light, compact, and has a shockproof base that does not scratch nor lose its aesthetic value. Displays (2.7-inch rear and 1.8-inch front) are non-glare. Its battery-powered design (2AAA) is super convenient while the premium accessories (flash and 4x digital zoom lens) and large storage offered (33 GB Micro SD). 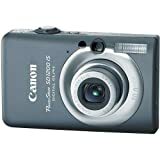 Talking about the best budget digital cameras retailing for less than 100 dollars, PowerShot SD1200IS from Canon has featured in many reviews because of the quality that people get. While its 3x optical zoom lens is not as powerful as some advanced models in this niche, it is one of the best for close quarter photography. In synergy with the 10MP sensor (DIGIC 4) provided, for instance, pictures are clear and blemish free. The smart auto feature offered, on the other hand, selects proper settings based on your environment while its dark gray body is not only aesthetic but also has a built-in 2.5-inch LCD screen with a non-glare and PureColor technology that eases usage. Even though simple, you also get a face detecting self-timer for shooting self-portraits and expandable storage that supports both SDHC and SD memory cards. 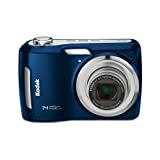 Equipped with an advanced facial recognition software, a 5x optical zoom lens, and a 14MP sensor, Kodak Easyshare C195 is a fun to use budget camera (in blue) that shoots crisp and clear photographs. Its screen is a large 3-inch model while the novel one-button upload feature it comes with allows you to share your photos instantly to a preferred email address or a social site.